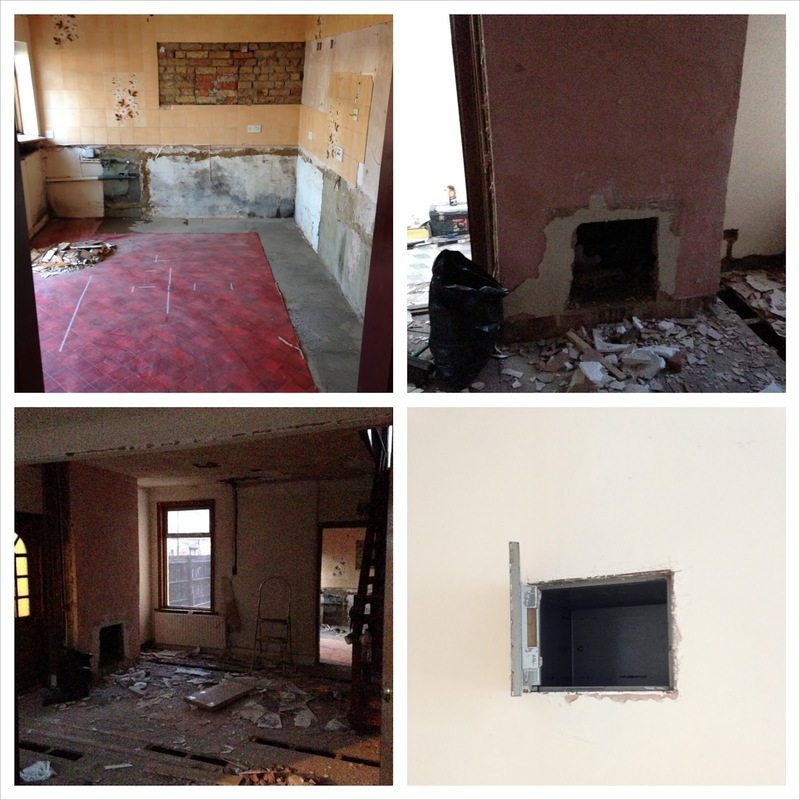 So we started our renovation on 22nd May 2015, as we got the keys to our first house. Some of the first pictures of the house in it's 1970's and 1980's glory and our first thoughts were recorded in my first post about our renovation journey. After taking stock in the situation we had a plan. As we were working on a tight budget we had to compromise with some things. Our plan was to gut as much of the place as possible, but use as much of the things that were still there to save money and do much of the work ourselves to save on labour costs. Before we signed on the dotted line, we knew there were several things that needed to be done before we would move in. Rip out the kitchen and get a new one. The pictures didn't do justice to it, but all the appliances were ancient, and the cabinetry past its best. As far as we know it was installed late 1970's. Refashion the stairs. It was evident that it was not safe for children due to lack of banisters, so we planned to install a new newel post and banisters, potentially glass or perspex. 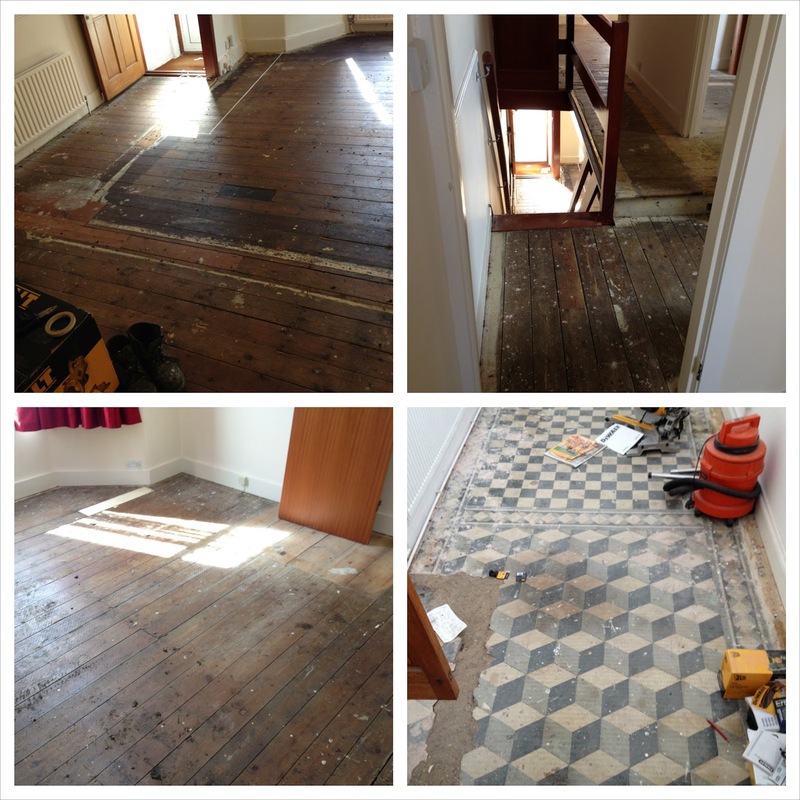 Check the floorboards and if possible restore the original floorboards to their former glory. Open up the doorway to the kitchen to make more of an open-plan structure in the place. Re-wire everything and re-plaster where needed. The front windows were failing (rotten wood, condensation between glass panels) so we started looking for wooden sash windows to bring back the period features. Then the work began. It all went fine to begin with, but then little by little more and more things began appearing. We knew the kitchen was going to be expensive, but when we started to get quoted for the type of kitchen we wanted going for £8k-£11k (without worktops and appliances!) we started to worry. We knew the stairs would be an added cost, but after having the first carpenters in to give a quote we got worried. All the carpenters looked at the staircase, said not up to code, has not been done by a professional, and they can't refashion it into anything safe as it is too shaky. They have nowhere to fit the banisters in. The whole thing needs to come down. By the way, it'll cost you £6k. Oh. We got builders in to look at opening the wall between the kitchen and living room. A fairly easy piece of work we assumed, knock down a little bit of the wall on both sides of the door, install an RSJ, and that's it. Until we looked at the wall underneath the stairs closer. A stud wall, with nowhere to attach the RSJ to. And then we realised the stairs were akin to step ladders, just attached to the floorboards above and carpenters outlined how they will need a structural support underneath the new staircase. Oh. We had the plumber pop in by to do the kitchen. As he walked around the place, he saw that pipework had been pulled outside the house, rather than chased inside the walls. The pipes would need to be removed and done properly. Oh. After husband got in the house to do chasing for the electrics and new plumbing, he hit a damp spot in our bedroom and in the living room. In our bedroom practically the whole of plaster underneath the bay window had to be brought back to bare brick. In the living room the damp spot was smaller, but likewise back to bare brick it went. Oh. After which the ceiling in the dining room was inspected, found to be failing, and was brought down completely. It was sketchy and about to fall down and crumbling. Lath and plaster was gone and just the floorboards and joists above remained - you could see through to the upstairs. After discussing with the neighbours we discovered there had been a massive leak a few years back, the lath and plaster had been thoroughly soaked and it had been re-decorated, with new plasterboard stuck on top and the bathroom done up. Did the seller disclose any of this? No. So we will be sending an email to our solicitors. After removing the ceiling we discussed with the plumber again and agreed we might as well replace all the old copper pipework to modern plastic now that it was exposed, and as we changed the pipework we might as well change the radiators to prevent the new pipes to be exposed to sludge from old radiators (which would have needed to be replaced anyway in a few years). Oh yeah, and those beautiful restored floorboards we had in mind? Downstairs floorboards were pretty knarled but upstairs was surprisingly good. However, after the electricians had popped by, ripping and drilling through everything we expressly told them not to, the floorboards upstairs were looking awful. Another £1k for click flooring upstairs then. With all these additional costs I am afraid the new beautiful wooden sash windows flew out of the window. And we would have to deal with the failing nasty uPVC horrendousness until we get more money. Hey, we did at least have one positive surprise. We found a wall safe. Unfortunately there was nothing inside that would have helped us with the renovation costs! Oh dear. That must be so disheartening. But once you have finished it all, I'm sure it will be fabulous. Your ideas sound great. The grey and white tiles are amazing. Are you keeping them? I suspect there is something like that under the laminate in our hall but my husband refuses to have it ripped out just because I have a gut feeling. I'm not giving up though! We have so many big ideas, unfortunately not as big wallets! :D So we have had to compromise, and partly, also work with the house to bring some of our ideas into more practical sphere. Yeah, well, when we bought the place we knew there would be a lot of things to do and a lot of them would have to be done before moving in. What a bummer situation you guys have faced, it is just horrible when you get problems with your house :( Hopefully fixing them will go well! I'm really enjoying reading about your house renovation! The tiles (are they tiles?) in the hall look amazing. Will you be able to keep them despite the damage? Thank you, I am glad to hear that! Not sure about the tiles, as they aren't actually in the hallway, but in a lean-to / conservatory, and it appears they are outdoor tiles, and appears they are on top of ground rather than proper foundations. So it might be tricky to move them. Haven't had a proper look yet as have been too preoccupied with the sprog when on site, but will do when I get there the next time :) Would love to salvage them, they are beautiful!